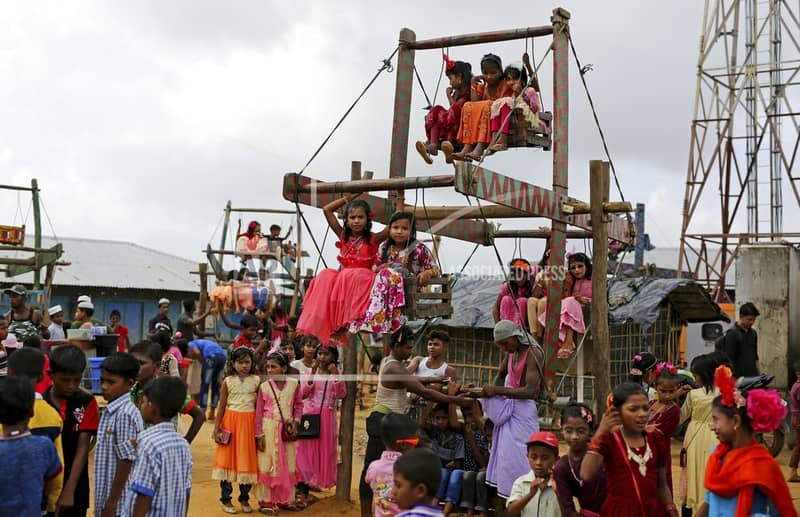 Rohingya refugee children enjoy a ride on a rudimentary ferris wheel, specially brought in to the camps for Eid al Adha celebration at Kutupalong refugee camp, Bangladesh, Wednesday, Aug. 22, 2018. One in two Rohingya children who fled to Bangladesh without their parents were orphaned by brutal violence, said a new research study on Saturday. The research was conducted by Save the Children, a non-government organisation marking the one-year anniversary of the Rohingya crisis, said a press release. There are currently more than 6,000 unaccompanied and separated Rohingya children living in Cox’s Bazar, where they face crippling food shortages and are at increased risk of exploitation and abuse, the organisation said. According to the study conducted on 139 unaccompanied and separated Rohingya children, seventy percent of them were separated from their parents or main carers by violent attacks, 63 percent of them were separated during a direct assault on their village and 9 percent were lost as their family attempted to flee to Bangladesh. Of the 139 children, 50 percent claimed that their parents or main carers had been killed in the attacks, leaving them orphaned, with many describing eyewitness scenes of brutal violence. Save the Children, in its statement, called for the perpetrators of these systematic, ruthless and deliberate attacks in Myanmar to be held accountable under international law for their crimes, and for all countries to support initiatives at the UN to bring the perpetrators to justice. Save the Children’s Country Director in Bangladesh, Mark Pierce, said, "While our data can’t claim to be representative of all orphaned and separated refugee children in Cox’s Bazar, it paints a frightening picture of a bloody conflict where civilians were targeted and killed in large numbers." He also claimed these children are more vulnerable to risks like trafficking, early marriage and other forms of exploitation. Access to safe, quality and inclusive learning opportunities for the displaced children as well as targeted mental health support for the most distressed need to be ensured, he urged. Save the Children’s Country Director in Myanmar, Michael McGrath, said, “It’s been a year since these children had their childhoods ripped away. The world has failed to hold the perpetrators of these barbaric attacks, including the Myanmar military, to account."